I can’t remember the last time I screamed at the top of my lungs. Oh wait, yes I can: It was this morning, in a Brooklyn backyard, inside a “vent box” specifically designed to capture cathartic wails. Screaming into the void is something I fantasize about daily, and now that I’ve done it, I can say it’s 100 percent worth the hype. 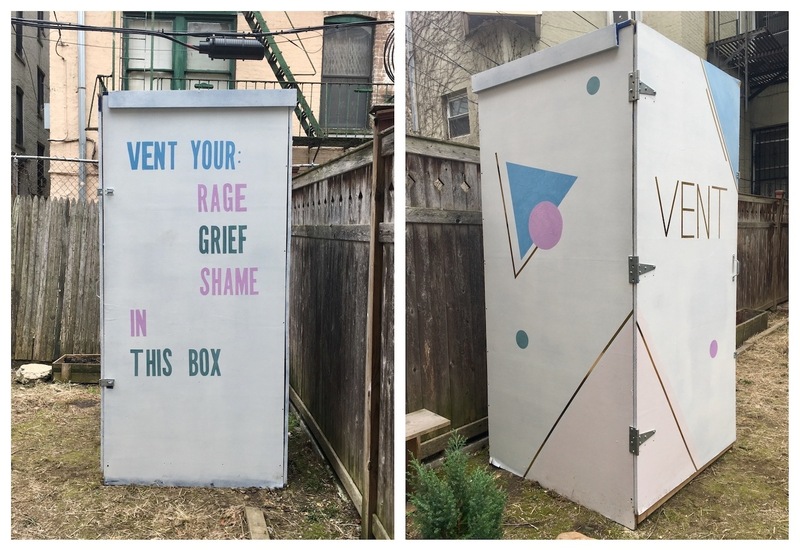 As I stand in the backyard of Huich In, a New York City-based hairstylist and inventor of the marvelous shrieking booth, she tells me that the Vent Box is all about “joyful release.” You meet yourself in the box and get real about your deepest fears and feelings. “It’s about honoring our shadows and our emotions. It’s like information, right? It’s bringing our shadows to the light so then we get to the peace, and harmony, and joy,” she tells me. Now, In rents the box (which she tells me is just a prototype, just the beginning of this project) to yoga studios, parties, and conferences—anyone who needs to scream into the void. Since I now found myself conveniently in her backyard, I decided to give it a try for myself. The inside of the box is padded floor to ceiling with blue styrofoam. “To muffle the sound of your screaming,” In says with a laugh. I step inside and she latches the door behind me. As I stand there surrounded by darkness, willing myself to make a noise, I think: “How do I scream again?” I don’t know why, but I feel scared to raise my voice that high, to be so raw out loud. I scream inside my head, oh, once an hour or so, but it occurs to me that I go out of my way to be quiet and unobtrusive in my life outside of the box. My first attempts at putting the soundproofed space to good use are futile and In lets me out of the box. She offers a few words of encouragement and sends me right back inside. This time, I feel ready to yell. Through the tiniest crack in the door, In begins to cheer me on, and suddenly, I’m screaming. Not in the high-pitched horror movie kind of way, but in a most guttural manner. The sound seems to be coming from an uncharted place deep within myself. It feels damn good. After a few minutes, the best thing happens. I start laughing. Laughing because—in a bizarre twist of events—I’m in a box, screaming out 23 years of repressed elation, sadness, frustration, and emotion that has no name. When In opens the door once more, I’m relieved. “If you’d left me in there much longer, I would have started crying,” I tell her. It’s true. Something about the dark loneliness made me want to live out the full spectrum of human emotions in double time. Alas, reality calls me back to the office. I thank her and I leave In’s home. Did you know emotions can be both “hard” and “soft?” It’s true! If difficult feelings arise during meditation, here’s your plan of action.